In this tutorial, I’m going to reveal an awesome native ads spy tool that will allow you to spy on native ads with ease. I’ve been using this tool since June 2018 and I absolutely love it! I’ve tried TONS of different native ads spy tools but none of them come close to Anstrex. All of the links in this post are affiliate links for Anstrex. If you use my link and enter the code nar_20 at checkout, you’ll get 20% off any one of their monthly plans for the lifetime of your account. By the way, I have another post on how to spy on push notification ads too. The rest of this post includes a plethora of different helpful info about running native ads. I highly suggest reading through everything on this page, as it includes some of my best-kept native ads secrets that I’ve discovered since I first got started with them back in 2014. Before going any further, I’d like to explain how native ads work… just in case you’re not too familiar with them yet. The above example shows some native ads from the native ad network, Outbrain, being run on CNN.com. To a visitor of CNN’s site, these ads really look like content. They blend in very well with the rest of the content on the site. That’s how they got the name native ads. They look native to the site. Much like any other ad network that you’re used to, advertisers can log in and set up their own native ad campaigns however they want. One of the biggest differences between native ads and other ad networks though, is probably their targeting options. And, that’s about it. You really have to be running a mass-appeal offer. Something that has a broad interest. I’ll talk more later on about the best offers for native ads. There are new native ad networks popping up left and right. Personally, I wouldn’t run on a new network until someone else has proven it to be profitable. 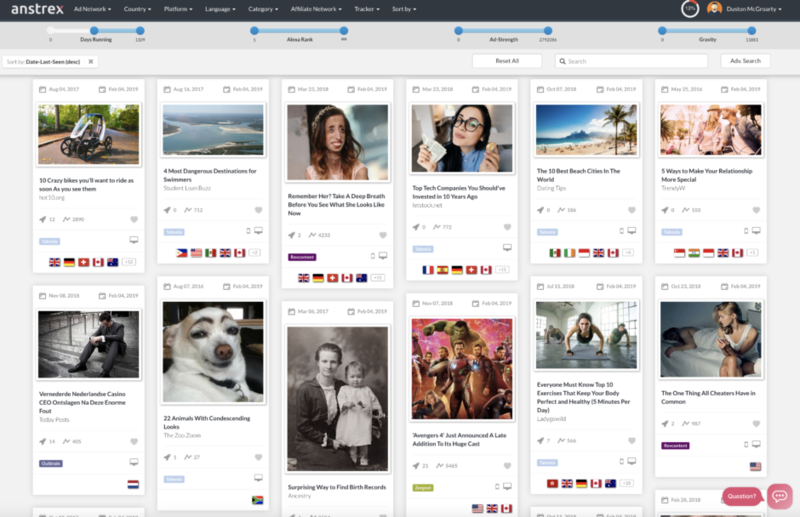 That’s a LOT of different native ad networks to choose from. One of the most common questions I get is, which native ad network should I use… or… which native ad network is the best? Now that you know the best native ad networks, lets talk about the best offers for native ads. Like I said earlier, the broader the better here. That’s not to say that you can’t make native ads work for a niche market. It’s definitely a possibility. Those are the most common offers I see being run across many of the different native ad networks. But probably the most common type of native ad you’ll find running, no matter which network you’re looking at, are content ads. These content ads use a strategy called native ads arbitrage to make money. Advertisers who promote nothing but content with native ads, make money from people clicking on the ads on their own website. It’s nothing for some of the larger native ads arbitrage guys to be doing $1,000 per day in profit. Some even more than that. The concept is simple, you make more from a visitor than what you paid. When you start your native ad spying with Anstrex, you’ll see more arbitrage ads than anything else. It doesn’t matter the country, the ad network, or the device, the top native ads are always arbitrage ads. 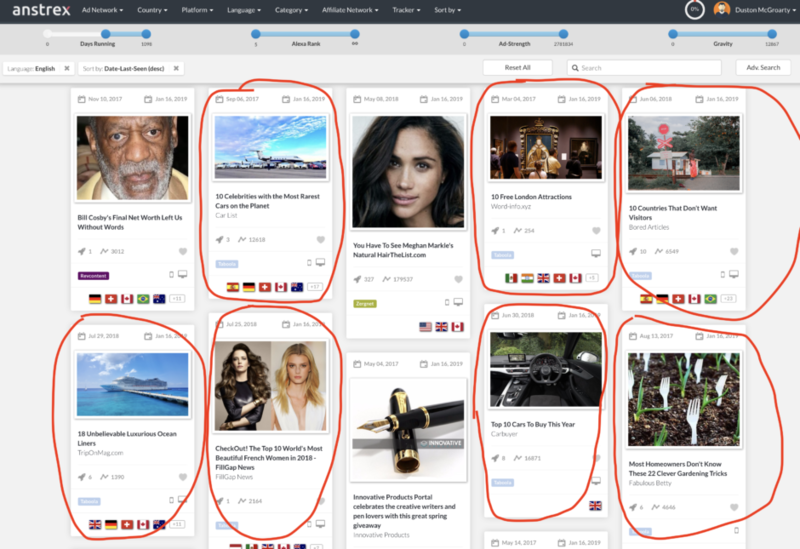 The ads I’ve circled in red are obvious native ad arbitrage campaigns. They’re the typical “slideshow” style blog posts where new ads get displayed when the visitor clicks the next button. What’s not so obvious about that screenshot is, two of the remaining three ads that aren’t circled are also arbitrage campaigns. In that last screenshot above, I had the filters in Anstrex set to English language, running for at least 50 days, and I sorted the results by the date they were last seen (descending). What that means is, that screenshot is showing the top 10 native ads (in the English language) that have been running for at least 50 days. Of those top 10 ads, 9 of them are native ad arbitrage campaigns. That’s how you find profitable native ad placements. If an ad has been running consecutively for any length of time, it’s likely successful and either already profitable, or dang close to getting there. I’m including this here just in case you’re a good fit for my native ad agency. Yes, I also run a native ad agency and take on clients in a number of different markets. If you’re not sure whether or not native ads is right for you business, take the native ads quiz here.